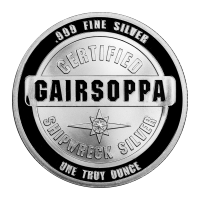 líc Slova "Certified Gairsoppa Shipwreck Silver One Troy Ounce .999 Fine Silver"
rub Profilový pohled na SS Gairsoppa z roku 1920 a slova "SS Gairsoppa Sunk February 17, 1941"
Slova "Certified Gairsoppa Shipwreck Silver One Troy Ounce .999 Fine Silver"
Profilový pohled na SS Gairsoppa z roku 1920 a slova "SS Gairsoppa Sunk February 17, 1941"
Stříbrná mince z vraku S.S. Gairsoppa 1 oz These rounds are made from recovered sunken treasure from the S.S. Gairsoppa, raised to the surface by Odyssey Marine Exploration. The SS Gairsoppa was a steel hulled British steam merchant ship that was built and launched in 1919, likely named after Gersoppa falls in India. Owned by the British India Steam Navigation Company Ltd of London it had been a civilian merchant ship until it was enlisted for the war effort as a cargo ship for war supplies. During a supply voyage that began in December, 1940, she was loaded with silver ingots, pig iron and tea sailing from Calcutta, India to Britain. The Gairsoppa had sailed around the Cape in South Africa to the South Atlantic where she met up with a fleet of other merchant ships at the port of Freetown in Sierra Leone under Master Gerald Hyland. She was to sail from there to Galway, Ireland where the cargo would be offloaded. But not long after leaving Sierra Leone the fleet was beset by high winds and heavy surf in the open waters of the Atlantic. The Gairsoppa began to run low on coal and was forced to separate from the rest of the fleet in order to make a more direct route to Galway. She never arrived. On February 16, 1941, the S.S. Gairsoppa was spotted by a German Focke-Wulf Fw 200 aircraft and was subsequently torpedoed on February 17 by a German U-boat designation U-101 under the command of Ernst Mengersen and sank with 85 hands lost. 1 life boat under the charge of the second officer, R.H. Ayres managed to escape with 6 other crew members, but only Ayres was pulled from the sea alive after the boat capsized. For almost 70 years the Gairsoppa sat at the bottom of the sea, nearly 3 miles deep in the Atlantic Ocean about 300 miles Southwest of the Irish coast. After a couple unsuccessful attempts to find a salvage crew on September 26, 2011, Florida-based Odyssey Marine Exploration confirmed the identity and location of the Gairsoppa. Recovery began and as of July 23, 2013 a reported 61 tons of silver bullion had been recovered. The majority of the silver recovered (3 of 4 lots) was 915 pure Dore (partly refined) bars. Here is your opportunity to own a piece of history. With only a limited amount of these 1 oz rounds ever made, they are sure to go fast!